Far too many people wait until they are in the midst of a health care crisis before thinking about what options are available or what care they or their loved ones would have wanted. Most hospice care is provided in the home – where the majority of Americans have said they would want to be at this time. Care is also provided in nursing homes, assisted living facilities, and hospice centers. Care is paid for by Medicare, Medicaid, and most private insurance plans and HMOs. The National Hospice and Palliative Care Organization reports that more than 1.5 million people received care from our nation’s hospices last year. Hospice providers can help with information about care options and choices and ensure you live as fully as possible throughout your entire life. They will make sure your loved ones receive support as well. One of the best ways to make sure you and your loved ones benefit fully from hospice, should you ever need this care, is to talk about it before it becomes an issue. Learn about your options and become informed about what hospice care truly means; so many times, a family is scared to have their loved one receive hospice care because they don’t really know what it entails, or what it is meant to do which is simply, provide comfort, compassion, ease of mind, and dignity. 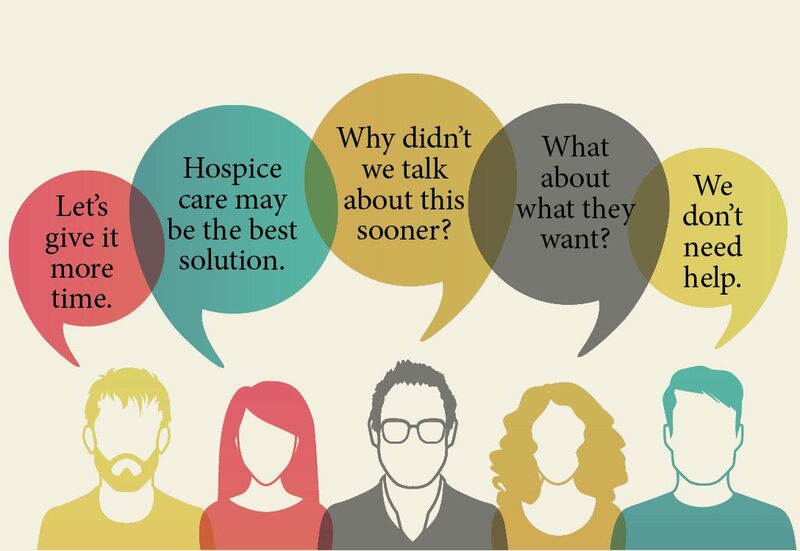 For more information on how to get the conversation started with your family and loved ones, contact Hospice of Yuma at 928.343.2222 and ask to speak to a Hospice Liaison.